I've had many ask me about my trip to Kilimanjaro, and I figure the best way to share this is here. I am paying for this blog after all, so I may as well use it. Climbing Kilimanjaro had been in my sights for a long time, and I spontaneously signed-up for it in April of last year without any idea of what I was getting myself into. I booked the climb for the best time of the year, September, when it's cold but precipitation is lowest - ensuring clear skies throughout (I'd much rather brave the cold instead of mud). I could spend an entire blog post typing why Kilimanjaro should be on everyone's bucketlist, but the internet can tell you that. I'll just share my experience to Uhuru. Unlike most mountains around the world, Kilimanjaro is unique in that a guide is mandatory to climb it. There are countless of guides and outfitters out there from local to foreign, offering different sorts of bells and whistles. I booked with G-adventures after hearing great reviews from friends who have used them before. They just seemed to offer the most hassle-free package for a great price. They are also a local (Canadian) company - bonus points. I definitely did not want the popular routes as I hate crowds, this eliminates Machame and Marangu. Rongai is the newest route up the mountain (so it's relatively unknown). It is also the only route from the north. This makes it a very isolated and quiet route. I wanted a back-country experience. The popular routes have well-carved trails and huts complete with power and running water versus tents. I wanted to stay in tents despite my lack of camping experience. The Rongai route descends via the Marangu route, so you get to see more. The route with the best scenery from what I gather is Lemosho, but takes a day longer than the rest and costs quite a bit more. I found Rongai to be the best compromise. Goruck GR-1 Backpack: This is a fantastic all-around backpack that's built like a tank. It did the job really well, held all my items, comfortable, and had a hole for a hydration bladder. Two downsides: 1) It didn't have a spot to clip trekking poles onto, and 2) it was heavier than I would have liked. The weight did take a toll towards the end (and summit). In retrospect, I should have gone with a bag that was purpose built for hiking/climbing. TAD sweater: This is a fantastic 100% merino sweater that's warm. The one major downside is that it does not pack small at all. If I were to do it again, I would bring a "performance" fleece that packs really small. Boots: Mammut T-Advance GTX - I bought these a few months in advance and wore them daily to break it in. Gloves - Outdoor Research Arete - These gloves are insulated, waterproof, and includes a liner, win-win. Sleeping Bag ($40 USD): This item I really didn't want to buy. I simply do not camp enough to justify the price tag on a -20C-rated down sleeping bag. The bag I rented did the job - it had signs of wear, but it was clean and kept me warm at night. Having said that - another in our party also rented and didn't realize it was torn till the first camp, Porters had to scramble to sew the bag together. I'd suggest inspecting the bag before leaving for the hike. Trekking Poles ($12 USD): I wasn't really sure if I needed these. Many online guides suggested them, and I found them to be pretty useless on the way up, but they helped a lot on the way down. Even then, you can do without these. Hard Shell Pants: Fortunately, it did not rain during my entire trek, so I only wore these on summit day to act as a windbreaker. Gaiters: Many guides/checklists suggested these, and many of the guides/porters wore them all the time. Personally, I found them completely unnecessary and never wore them once. Having said that, I can see these being useful if there was snow on the summit trail. I trained for Kilimanjaro with a mixture of weight, cardio, and rock climbing workouts. I would do cardio workouts 4-5 times a week for a period of 30-40 mins, alternating between the elliptical, rower, and the Stairmaster. I'd lift weights 3 days a week, and I'd go rock climbing (indoors and outdoors) roughly 2-3 times a week. I also went on a few 4-6 hour hikes every so often, and in retrospect, I should have done more of that as it's the activity that best prepares for Kilimanjaro. What makes Kilimanjaro challenging is the altitude, and the idea is to be able to exert the least amount of effort throughout the hike. The fitter you are, the less your body has to work, increasing chances for a summit and having a better time. Cardio is important because your heart compensates for low oxygen by beating harder, even at rest. The closest airport to Kilimanjaro is Kilimanjaro International Airport (KIA), a small airport with frequent international flights to Kenya, Ethiopia, Qatar, the Netherlands and many more. I flew in with Precision Air via Nairobi. I've read that losing your baggage in African airports is very common. So it was critical to wear and carry everything I could not do without. I wore my hiking pants, boots, and fleece throughout the flights, and carried jackets, waterproof gear, gloves, and other not-easily-replaceable necessities on my carry-on. Everything else was checked-in. Moshi, the closest town to Kilimanjaro, is an hour's taxi ride away from the airport. I checked into my hotel and collapsed on a bed after a long travel, and later slowly met the other members of our group. In turns out there were 9 members in total. 7 Canadians, 1 American, and 1 Brit. There, the G-adventure "CEO" and guide introduced themselves, gave us a thorough synopsis of the climb, and answered any questions that we may have had about the climb. Fun fact; Bug Spray is not needed! The mountain gets chilly even on the first night and mosquitoes/bugs cannot survive. Malaria pills are not needed on the mountain, but they are definitely required on days spent in town. Wake up at 8am, breakfast at the hotel, load the bus, and off we go. Our first stop was to get our climbing permits, we had to drive to the main gate which located at the base of the Marangu Route. Our guide sorts out the paperwork and jump back on the bus to the beginning of the Rongai route, on the other side of the mountain, straddling the Kenya Border (see map above). We arrived the Rongai gate around mid day. We were given our already prepared carb-heavy lunch while the guides and porters assemble, and start carrying our gear. The first day was easy. It was about a 3-4 hour hike. First, through a forest that resembles a typical Ontario forest (with colobus monkeys and reddish dirt), then a lush rainforest for a brief moment, and then vegetated moorland. It was interesting how quickly we went through the difference ecological zones in just the span of a few hours. Simba camp was the first camp (2,671m), and of course, it was already all set up before we got there. The porters beat us to camp, some carrying as much as 20kg. Every two trekkers share a tent while we congregate and have meals in a larger "mess" tent prepared with chairs and a "dining" table. The mess tent was already prepped with snacks upon arrival. An hour later, meals were prepared. Dinner usually starts with a soup, and then a carb-based meal (spaghetti, rice) with a decent protein serving. After every dinner, the guides give us a briefing for the next day and take our VO2 max and pulse readings to monitor our condition. The temperature throughout the hike was manageable, probably in the mid-20s, however, I was pretty shocked at how cold it got after sunset, even on the first night (probably high single digits). Many guidebooks suggested bringing a pair of flip flops for wandering around camp, but I've found that it is simply too cold to be wearing sandals. The best part of the cold ight however, was the crystal clear night sky! If you've done any reading about Kilimanjaro, you've come across Diamox. 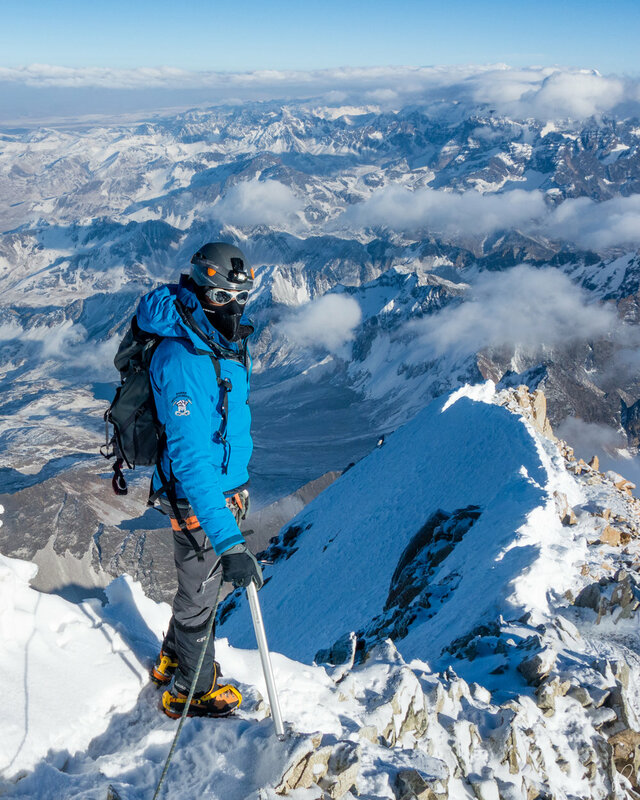 The prescription drug used to aliveate altitude sickness symptoms. Diamox is controversial on the mountain, some took it, some didn't, some had it but didn't take it. I took Diamox throughout. I was prescribed 7 pills by the doc, and was to take half in the morning (125mg), and the other half in the evening for every day of the trek. I was warned by the doctor that the drug is a diuretic, and I mistakenly assumed that it would have the same effect as coffee. I was wrong, it's much worse. On the first night, Diamox interrupted my sleep 5 times to take a leak - so often that the shortest frequency was as little as half an hour. A sleepless night was unpleasant, let alone the dark and cold walks to the toilet. The next day, our guides advised to take half a pill after breakfast, and the other half immediately after lunch (as opposed to the evening). This schedule works much better and really helped me sleep at night. Many others complained of tingling of fingers and toes as a side effect of diamox. I only felt this once on summit day, and even then it wasn't bad. Our briefing mentioned that day 2 would not be difficult, but it would be long, approximately 7 hours in total. We were all awake by 7 am, our porters bring warm water to the tents to wash our hands and faces while we get ready for the day. After a simple quick breakfast, we began. it became evident that the shrubs were getting smaller the higher we got. It wasn't long before we got to some open ground, and managed to get a clean glimpse of Kibo. I appreciated how predictable the weather was in September. Skies are crystal clear in the morning, clouds start to form and rise around mid-day, and by the time the sun sets, it gets really cold and all clouds vanish. It was the same pattern everyday throughout. After 7 hours, as advertised, we arrived at our second camp, Kikelelwa Camp (3,600m). With the exception of the vegetation becoming more scarce, it was a rather uneventful but manageable hike, entirely through the moorlands of Kilimanjaro. It becames really evident how high we've gotten as the clouds disappear in the evening, with Kenya visible down below. This is a big mountain. I was pretty tired from a sleepless night before, so I managed to get a good sleep on the second night. I was one of the first of the group to wake-up - nature's call - slightly before sunrise, and for the first time we were over the clouds. It was a spectacular sight. I got my camera and braved the cold to take photos of the sunrise over the clouds. I could only imagine how it would have looked from the summit. Kibo is the highest point in Africa, so it's the first to see the sunrise every morning. Day 3 was going to be shorter than the previous day, but steeper and as such, a bit harder. The plan was to head to the base of Mawenzi, where we would set up camp. As with every morning, a quick breakfast, pack our bags, and off we go. The trail was steeper from the get go, and the I noticed that the guides started to pace us slower... "Pole Pole" or "slowly slowly" became the phrase of the day. This was really the first time I got a hint of the altitude, being ever so slightly out of breath. We took plenty of breaks throughout the hike. Vegetation was getting scarce, and the terrain was getting rockier. Roughly 3-4 hours into the hike, I started to feel a mild headache, a symptom of altitude. We got to camp in time for lunch. The plan was to take a break or nap for a few hours and then take an acclimatization hike later in the afternoon. My headache was getting worse. Altitude headaches are weird, it feels as though your brain is swelling and pushing against your forehead. To make matters worse, it was incredibly bright. Even covering my eyes with sunglasses and a hat inside my tent felt useless. I simply couldn't relax and rest. After a couple of hours of lying down, I gave up the idea of resting and headed out to take some photos. By this time, clouds were rising, giving some refreshing bursts of shade. Our guides muster us for an optional acclimatization hike. Every one was good enough to go, and I agreed to push on despite my headache being painful and uncomfortable. Our acclimatization hike was great, we went about 200m higher further up Mawenzi where we appreciated the rocky views around. Our guides give a quick geological history of Kilimanjaro and then we head back down. By the end of the day, I noticed that my headache completely disappeared! Not sure how or why; whether it was the acclimatization hike or the fact the sun went down and was no longer blinding me, but I was relieved. I thoroughly enjoyed my dinner. I got out of the mess tent to a really cold night and I wandered out to capture one more photo of the stars. Once again, we woke up over the clouds. Morning were getting colder. It was time to pull out the down jacket as I stroll around for photos. The plan for day 4 involved traversing the mountain from the base of Mawenzi to the base of Kibo via what's known as the "saddle". We were told that it would take about 5-6 hours. At first glance, it was difficult to imagine how it would take so long. The trail was relatively flat on arid desert terrain, but the challenge lies in the altitude. The saddle is completely suspended over the clouds at an elevation of roughly ~4,500m. Looking across the saddle with base camp in the yellow circle. Doesn't seem too bad, does it? The clouds are so far down below the mountain, they are outside the frame of the photo. The first couple of hours was easy due to a slight descent and the relatively low morning sun. We reach a plane wreckage roughly at the lowest point of the saddle. After a small break, we carried on where things got tougher (for me at least). I start to feel the effects of the altitude. The sun was strong with no place to hide. The agonizing headache started to make a comeback. A small tourist plane crashed on Kilimanjaro in 2008, the wreckage remains. The closer we got to base camp, the steeper the terrain got. And I'll be first to admit the last stretch to base camp was tough. I would take a pause every 30-40 steps. I did eventually make it, but not without a blistering headache. Our tents were ready when we arrived, and I lied down to try and ease it off. We reached camp around 2pm, and the plan was to have dinner around 5 or so. Throughout the afternoon, my headache was only getting worse. Fortunately, Brian was prepared enough to carry Tylenol Extra Strength and gave me a couple of pills (Thank you!!). It worked wonders, I felt far better by the time dinner was served. After dinner, our guides gave us a thorough briefing of summit day, what to wear, what to expect, and what to pack. They took our pulse/VO2 max readings and my heart rate at rest was 99 bpm (usually 50 bpm for me). The plan was simple. Sleep around 7pm, wake up at 11pm, dress up, eat, and by 12am, we aim for the summit bid. Base camp is where the Marangu and Rongai routes merge, and so it is a noisy place. Unlike the majority of the Rongai route (where we were only 2 parties throughout), this camp had at least 10. Between the porters of all parties, there was a lot of activity and noise making getting any sleep pretty tough. I did get some shut eye around 8:30pm, only to be woken up by my bladder around 10:45pm. I only had a couple of hours of sleep prior to the summit bid. Oh my god, it was cold. I did not have a thermometer on me, but I guess that it was around -5C to -10C. I dress up. For tops; a base layer, long sleeve shirt, fleece, and then my jacket. For bottoms; base layer, two hiking pants, and then hard shell pants. I did not wear a hard shell top, but I had it in my pack. Balaclava and headlamp on, and I was set. I got to the mess tent and met everyone all geared-up. High energy foods and sweets was served, but I noticed that a few in the group completely lost their appetites and barely had anything to eat. I felt great on the other hand. No headache, no loss of appetite. We were warned that our hydration bladder tube would freeze; I had a thermos prepped and asked a porter to fill it with warm water. Midnight on the dot, we march up. Looking up into darkness, only the headlamps of parties before us and the stars above could be seen, in most cases indistinguishable. The first few hours involved tight switchbacks over loose volcanic scree gradually getting steeper. We stopped for 5-minute breaks every hour. At the third break, I had completely lost my appetite, struggling to even chew one bite from a clif bar. By the forth break, as expected, my hydration tube froze. I pull out my thermos to find water too hot to drink (the thermos did its job!) - I was officially out of water. The trail getting steeper and rockier. By the fifth break, I was starting to feel tired. Looking behind, a faint orange outline starts to appear, sunrise is near! Excitement builds. Barbara gave me a few sips of water (Thank you!!! Saved the day!). Moving on, you look up to see the edge of the mountain and darkness thinking you're close, and once you get there and look up again, only to realize there's so much more to go. That, in my opinion, was the worst part, the feeling that it would just never end. This part is pretty hard to put in words, it's really something that needs to be experienced. Half way between Gilman's point and the summit is Stella Point (5,756m). There we took a break. I was feeling pretty exhausted and took a seat on a rock. A guide (Mathiya) helps me out by giving me some water and took my backpack off me lightening my load (this is why I should have used a lighter backpack). And we kept pushing on. The last stretch to the summit was hard. The terrain was flatter and manageable, but that's when the altitude took its toll. I would take a pause every 10 small steps, a break every 50, my pulse simply racing the entire stretch. At roughly 7:30am, we made it to the summit, adrenaline kicked in when I saw the infamous board. We looked around in awe at an otherworldly landscape; The fast receding glaciers, the ice caps, the clouds very far down below, and Mount Meru in the distance. Fun fact; there's actually two "congratulations" boards on the summit! Mount Meru (4,562m) in the distance. As soon as everyone got their photo ops, it was time to head back down. The descent was much easier. My legs were so tired from working uphill for 5 days, it felt really refreshing to have the opposing muscles work for a change. The sun rises, and our guides instruct us to put on sunscreen. There is little UV protection at altitude, and its very easy to get sunburnt. On the bright side (pun intended), the sun thawed my frozen tube, and I had water again! In order to avoid the inevitable headache, I also preemtively took a tylenol (which worked like a charm, I did not have a headache that day). Back at Gilman's, we look down and saw just how far up we've climbed overnight - I wish I took a photo of this but even if I did, a photo would not have done any justice. Luckily, we didn't have to use the switchbacks going down, we could simply cut straight through. At 10am we reached back down to Base Camp. Our porters congratulated us and served us juice. By this point, we had been on our feet for 10 hours. I collapse in my tent for a break. But wait, it's not over. We couldn't spend the night at base camp and we had to descend further down to the next camp (I believe this was because base camp has no water supply, and the porters only brought enough for 1 day). After a 2 hour break, we had lunch, and we dragged ourselves further down. The next camp was the Horombo huts, which took another 3 to 4 hours. It was a pleasant and easy decent. It was a popular route so the trail was well trodden. Decending down the Marangu Route with porters hauling gear down. This was our last day on the mountain, which meant going down roughly 20km in the span of 6 hours to the main gate. Before we departed, we had a tipping ceremony, when we tip our guides and porters for all their great hard work. It should go without saying that our guides and porters really made our trip. Each one of them went out of their way to ensure that we were as comfortable as possible throughout, and if it wasn't for them, not sure if we would have made it up with so much fun. On the descent, you'd think that gravity would have helped, and it did in some way. But, with every downhill step, toes bang against the front of your boots. It was bearable at first as the descent was gradual, but it really started to hurt towards the end. Our guides advised to tie our boots as tight as possible, this minimizes the impact, it helped a bit. Vegetation thickens and shrubs increase in height. We eventually entered the boundary of the forest on the lower slopes, with dried out trees lining the trails. We stopped for lunch at Mandara Huts. The soreness from the day before started to kick in. Everything hurt; legs, back, and shoulders. This was our last meal on the mountain and it was refreshing to have it indoors for a change. Moving on, an arid forest transitions into a lush rain forest which reminded a bit of Tarzan. For the second time, I had the dreadful feeling "when will this never-ending trail end?!". We were descending at our own pace, and it was an interesting call to make, take multiple breaks and delay the end? Or push through the pain and finish earlier? Philip, Ash and I decided to push on. 6 days of carrying a backpack finally started taking its toll as my shoulders start to give up. Step by step, eventually, finally... after a total of 79km, we see the sign that ends our trek. We collected our summit certificates, took some photos, jumped back on the bus, and headed back to our hotel. I took a shower twice that day, and it was amazing. The last day we bid farewell to all the members of our group. As I head to the airport, I got a glimpse of Kilimanjaro for the first time from the ground, all covered in snow from an overnight storm. I was so happy when I saw this board!